Bulldozers have marked the end of an era by reducing part of the old Arnold school in South Shore to rubble. After almost 150 years, demolition crews moved in to make way for the new Armfield Academy, which is set to open in September. They have flattened the buildings on the north side of the Lytham Road site, which once housed the high school, offices, dining rooms, and lodgings, while contractors are refurbishing those on the south side, which was the old primary school. Former director of music Kenneth Shenton, who taught at Arnold from 1972 until he retired in 2005, said: “The demolition did not worry me; it was just seeing it all locked up and sad. “It’s probably good it’s gone because it has new life and it will benefit the people of Blackpool, which is what it’s all about. The main three-storey school building demolished was built by clergyman Thomas Ward in around 1870/71, and ran as Arnold House School for around 20 years until it closed. On May 4, 1896, Frank Truswell Pennington moved his school, South Shore Collegiate, onto the site from Alexandra Road. He changed the school’s name to the simpler Arnold, a fee-paying school that notably taught Nobel Prize winner Michael Smith, and expanded. 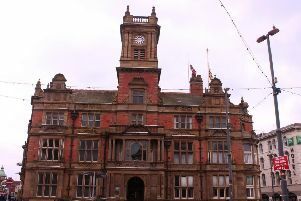 It merged with King Edward VII and Queen Mary School in September 2012, and controversially moved to Lytham in 2013 as AKS Lytham Independent School. In the five years since, the Lytham Road site has grown derelict, sparking concern among some of the residents living nearby. In 2016, the Fylde Coast Academy Trust (FCAT), which already runs a number of schools on the Fylde coast, announced it had acquired the land and would open a new all-through school, catering for both primary and secondary schoolchildren. Initially given the name Avenue Academy, a campaign was launched by former Blackpool mayor Robert Wynne to instead call it after former Arnold schoolboy, and Blackpool FC and England legend Jimmy Armfield. Mr Armfield, who died last month at the age of 82, later spoke of his pride after education chiefs bowed to the hundreds of people backing the change. Sporting honour boards left in the old buildings, one of which includes Mr Armfield’s name, will be given pride of place in the new school, while other items, including an old wooden lectern, will be refurbished and incorporated. Stained glass and foundation stones saved from the wrecking crews will be re-used, similar to FCAT’s Aspire Academy, which now features stained glass from Blackpool Grammar School that once stood on the same site. And a stained glass tribute to former Collegiate High School head girl Loren Stoker – who died aged just 16 from an undiagnosed heart problem in the 90s – will also be integrated. The newer design and technology block; memorial hall, named after those who fell during the two world wars; and sports hall, opened by Jimmy Armfield in 1999, are being refurbished. Mark Kilmurray, associate principal at Montgomery High School in Bispham, who will be Armfield’s headteacher, and said: “For over 120 years the Arnold buildings on Lytham Road and Arnold Avenue have been the centre of high quality schooling for generations of children; a school founded on Christian principles and a tradition of service. “The Armfield Academy, a member of the Fylde Coast Academy Trust will nurture a similarly aspirational environment and provide the community of South Shore with a high quality, high performing school in which every child really matters and which takes all of its young children through to being young adults. The new school is on course to take 160 Year Seven pupils, 60 reception class pupils, and a nursery class from September. They will be taught in the revamped south buildings while work continues to the north. When it reaches full capacity, it will be teaching 1,280 pupils between the ages of two and 16. Mr Kilmurray will be joined by Chris Lickiss, former headteacher at Unity Academy in North Shore, who will be executive principal. Both Montgomery and Unity are FCAT schools and have improved their standards in recent years, according to education watchdog Ofsted.